What is the link between down syndrome and Alzheimer's disease? What are the symptoms of Alzheimer's Disease in people with Down syndrome? 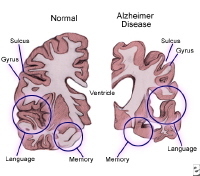 Alzheimer's disease (AD) is the most common form of dementia. The disease is progressive, and the brain degenerates. Alzheimer's disease is strongly associated with old age. However, it should not be considered a normal part of aging. People with Down syndrome, also called trisomy 21, develop a syndrome of dementia that has the same characteristics of Alzheimer's disease that occurs in individuals without Down syndrome. The only difference is that Alzheimer's disease occurs much earlier in people with Down syndrome; patients with Down syndrome begin to have symptoms in their late 40s or early 50s. Most (and maybe all) people with Down syndrome develop the brain changes associated with Alzheimer's disease. However, Alzheimer's disease is not more common in individuals with intellectual disabilities from causes other than Down syndrome. 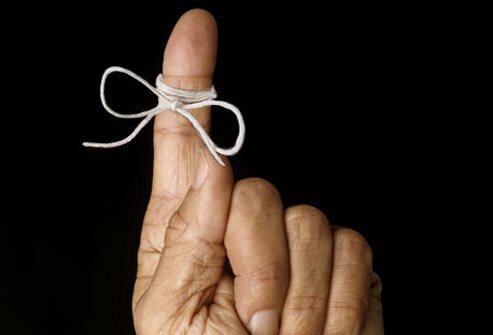 The percent of people with Down syndrome that have Alzheimer's disease increases with age, with a majority occurring in people older than 60. Alzheimer's disease decreases survival in people with Down syndrome who are older than 45 years of age. The reason Alzheimer's disease is more common in people with Down syndrome is not completely known. Alzheimer's disease is associated with increased production of a compound called amyloid beta in the brain. Amyloid beta accumulates and causes loss of brain cells called neurons. Exactly how neuron loss occurs is not well understood. The higher risk for Alzheimer's disease in people with Down syndrome may be related to the extra copy of chromosome 21 (which causes Down syndrome) because it leads to increased production of amyloid beta. 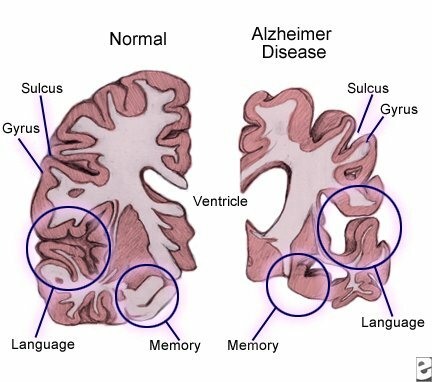 The age when symptoms of Alzheimer's disease actually develop may be related to a person's mental capacity (cognitive reserve) or some anatomic characteristics of the brain. That means people with greater brain weight, more brain cells (neurons), and more education may not have symptoms of Alzheimer's disease as early as people with less cognitive reserve. People with Down syndrome may develop symptoms of Alzheimer's disease earlier in life than other people because of their increased production of amyloid beta and their smaller cognitive reserve. In people with Down syndrome, the first symptoms usually develop at age 50 years, and the disease is usually diagnosed by age 52 years. Death occurs at an average age of 60.11 years. The time from the first symptoms of Alzheimer's disease to death is usually about 9 years. The main symptoms are confusion, disorientation, and wandering. These early signs are not usually recognized and are commonly misdiagnosed. Early behavior changes that are truly related to Alzheimer's disease are often seen as an exaggeration of the person's normal traits. For example, the person may refuse to follow certain directions or to do chores because of Alzheimer's-related mental changes, but this refusal may be perceived as stubbornness. Because these early changes are hard to recognize, only those familiar with the individual notice these changes. Changes can include change in daily routine, change in sleeping or eating habits, inability to make decisions about clothing, getting lost in familiar environments, and inability to remember the names of familiar people. Another early sign of Alzheimer's disease in highly functional individuals with Down syndrome is the inability to perform job duties. may have difficulty learning new tasks. Learning is usually impaired, but it is difficult to demonstrate in people with greater disability related to Down syndrome. Other early signs include loss of language and other communication skills, impairment of social skills, and progressive loss of "activities of daily living" (ADL) (for example, personal hygiene, dining skills, bathroom skills). ADL markedly deteriorate. The patient may depend totally on others for activities such as dressing, eating, walking, and toilet needs. Any behavioral problems are usually exaggerated, and psychotic behavior may develop. Social activities are reduced to a minimum. People with Down syndrome and advanced Alzheimer's disease seem almost to be in a coma. They totally depend on others and interact minimally with the environment. Motor disorders may be observed in the early stage but become obvious in the middle stage of the disease. Walking becomes difficult, and in the advanced stage, the person is confined to bed and has almost no voluntary movements. Eating disorders may be observed at the beginning of the disease but are more obvious in the middle stage. The person has problems swallowing and frequently chokes. Picture of a brain with Alzheimer's disease. Click to view larger image. Recognizing the early stages of Alzheimer's disease is difficult in people with Down syndrome. People with Down syndrome have a wide range of health problems as they age, and some of these may mimic or hide the presence of Alzheimer's disease. Also, the usual diagnostic tests used for diagnosis of Alzheimer's disease in people without Down syndrome do not take into account the existing disabilities of the person with Down syndrome. Many people with Down syndrome cannot be evaluated by standard psychological tests. Finally, some people with Down syndrome have limited verbal and other communication skills that may make assessment difficult. For these reasons, the methods used for testing for Alzheimer's disease in people without Down syndrome (for example, Mini Mental Status Examination) are unreliable in people with Down syndrome. The medical work-up for the diagnosis of Alzheimer's disease, that is, blood tests and neuroimaging studies (CT scan, MRI), is the same as for individuals without Down syndrome. The three tests mentioned above are questionnaires or scales to assess or document the evolution of dementia. Blood tests may be obtained to rule out certain other causes of dementia, such as infection, metabolic disorders (like thyroid imbalance), or medication effects. There is no cure for Alzheimer's disease. The disease progresses and becomes worse, despite treatment. The medications listed below have been used for or found to be useful to slow Alzheimer's disease progression, but few studies have been done with donepezil (Aricept) and rivastigmine (Exelon), in individuals with Down syndrome; and it is not clear how useful these drugs are in persons with Down syndrome. For more information on these medications see Alzheimer's Disease Medications. Medical treatment is directed toward treating the signs and symptoms of dementia, or treating coexisting behavioral changes such as psychosis, anxiety, or depression. Two types of drugs have been studied enough to gain approval by the United States Food and Drug Administration (FDA) and may provide modest improvement. Treatment for coexisting behaviors may include antipsychotics, antidepressants, or antianxiety drugs. Data continue to emerge regarding other potential drugs that may treat or decrease the risk of developing dementia. For a complete discussion of medications for dementia, see the article Dementia Medication Overview. This is a summary of scoring for the Alzheimer's Functional Assessment Tool. This tool can be used to document the progression of the symptoms, and it can also be helpful to evaluate the usefulness of any drug treatment or behavioral interventions. It is not intended to make the diagnosis of Alzheimer's disease. "Primary care of the adult with intellectual disability (mental retardation)"
Do you have a loved one with both Alzheimer's and Down syndrome? Please describe the symptoms. What treatment did your loved one receive for Alzheimer's and Down syndrome?